Glitter Eyeshadow Palette!! What A Deal!! Six popular colors of glitter: purple, black, green, gold, silver and laser. 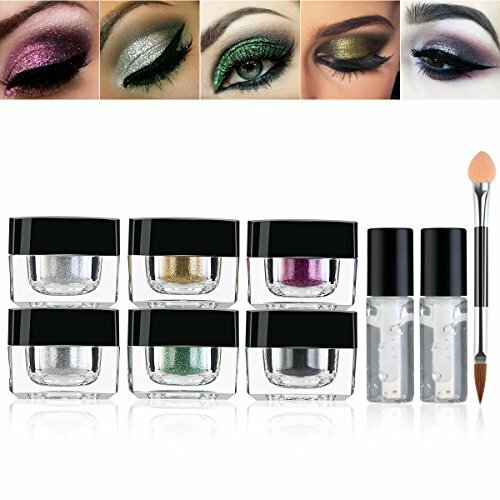 Fine-grained, cosmetic-grade glitter for eyeshadow and more, for both exotic or subtle looks. Comes with two glitter glues and eyeshadow brush, everything you need to use and apply glitter eyeshadow. Great valentines day gift for your loved ones. High-quality acrylic material container for the glitter. Easy to open, load up your brush, and close without mess or spillage. The glitter powder can also be used in facial, body and nails. Fine for sensitive skin and for all levels of skin moisture, no chemical smell.